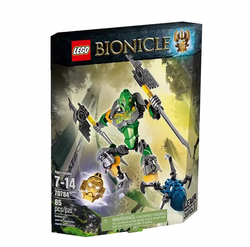 70784 Lewa - Master of Jungle is a BIONICLE set released in 2015. This is a description taken from LEGO.com. Please do not modify it. (visit this item's product page) Convert Lewa’s X-glider into 2 huge battle axes! Don't let the Skull Spider pop off Lewa’s mask! Combine with 70778 LEGO® BIONICLE® Protector of Jungle using building instructions available at LEGO.com/BIONICLE to power up for ultra elemental battle! Facts about "70784 Lewa - Master of Jungle"